Price = $25 USD / bottle (FREE SHIPPING). Shipped via EMS (Express Mail Service) from Indonesia. The following article is quoted from internet and this is just for information. Before you buy this product. please read and understand Terms of Service and Disclaimer available on this website. The stems are erect to sprawling and branched, growing 50 to 120 centimeters in height, with the lower sections being woody. The dark green, diamond-shaped leaves are arranged alternately along the stem, 4 to 8 centimeters long, with petioles that are less than a third of the length of the leaves. They are paler below, with short, grayish hairs. The apical half of the leaves have toothed or serrated margins while the remainder of the leaves are entire (untoothed). The petioles have small spiny stipules at their bases. The moderately delicate flowers occur singly on flower stalks that arise from the area between the stems and leaf petioles. They consist of five petals that are 4 to 8 millimeters long, creamy to orange-yellow in color, and may be somewhat reddish in the center. Each of the five overlapping petals is asymmetric, having a long lobe on one side. The stamens unite in a short column. The fruit is a ribbed capsule, which breaks up into 8 to 10 segments. The plant blooms throughout the year. 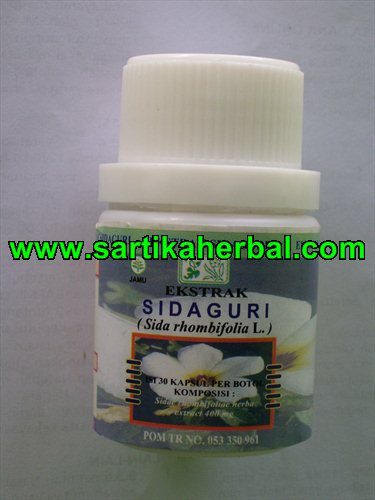 In herbal medicine, Sida rhombifolia has long been used for rheumatism, gout, joint pain treatment. Results may be different for each individual, there is no guarantee for results. Help the process of treatment.